Rick Wasmund hand crafts this whisky at the Copper Fox Distillery in Sperryville, VA. He malts his own barley, smokes it over a “unique blend of fruit wood and hardwood smoke,” then pot stills it in small batches. Aging employs wood chips in barrels and the method is secret. According to Wasmund, this results in the whisky reaching “optimal maturity much faster” (I’m glad he didn’t say that it ages faster). Well, that’s the information from the label, plus the fact that this is Batch No. 49 and aged for 16 months before being bottled at 96º… and it’s non chill-filtered. I picked this bottle up a few years ago for just under $50 in Louisiana and have shared it on at least 2 occasions with tasting groups to good reception. Here we go…. There definitely some non-peat smoke to the aroma and I’ll venture to guess that it’s the result of some apple and cherry wood. Additional notes of cigar box, cereal, honey, dark cherries, straw, rubber, spruce and lumber yard complete the nose. The palate is similar but with pronounced tannins and the sweeter flavors taking a back seat to the smoke, cereal, cigar box and straw. There’s a fruity aspect up front followed by light smoke, wood and straw before giving way to a peppery, leathery finish with lingering tannins and light smoke. There’s also a chewiness to this whisky that’s quite nice. Overall, this is a fairly young, flavorful whisky with a light fruit wood smoke that lingers a long time. The malt is quite evident as are the wood influences… even after just 16 months. I should also note that the color is a nice reddish copper. 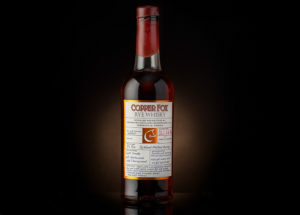 This is a an unusual (in a good way) single malt with a distinct, if not young, character. It’s got a nice nose and great mouthfeel with a pleasant taste and long finish, although I don’t think it will interest Scotch drinkers as much as it will American Whiskey drinkers. Like Balcones Brimstone, this is more of a niche whisky with an acquired taste, but not as brash as Brimstone, which I also enjoy. I’m guarded in my recommendation because of the unique type of smokey, tannic profile and I’m not sure why because I’ve enjoyed it. In any case, there you have it… adventurous whisky drinkers should check it out as the price is not bad and the whisky is pretty good. Stay tuned as I check out Copper Fox Rye Whisky soon. Posted in Whiskey. Tagged Copper Fox, Single Malt.